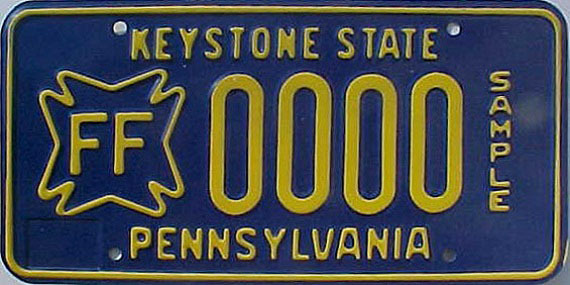 Yellow on blue base, sticker well lower left. 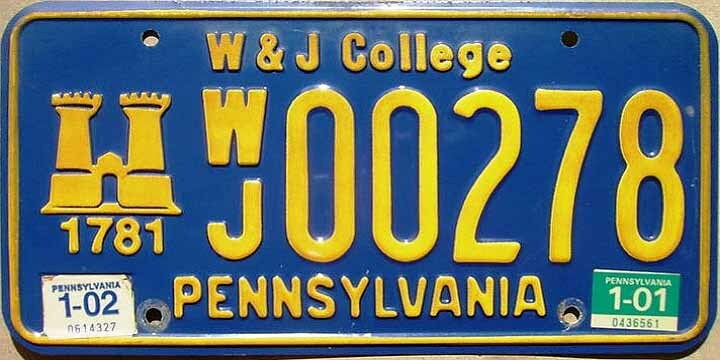 Replaced by www base on 7/3/2001. 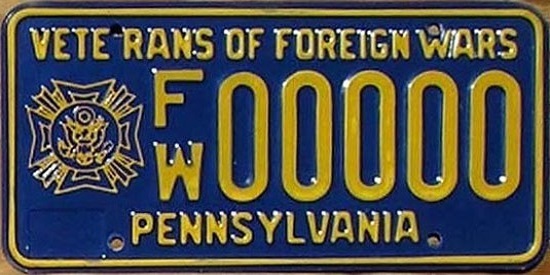 Replaced by www base on 8/10/2001. 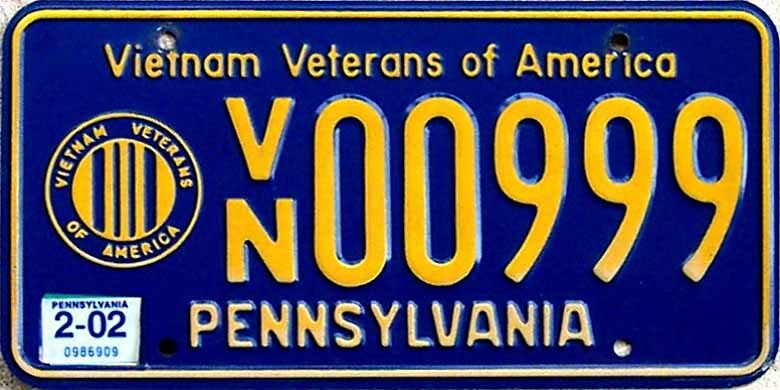 Replaced by www base on 9/12/2001. 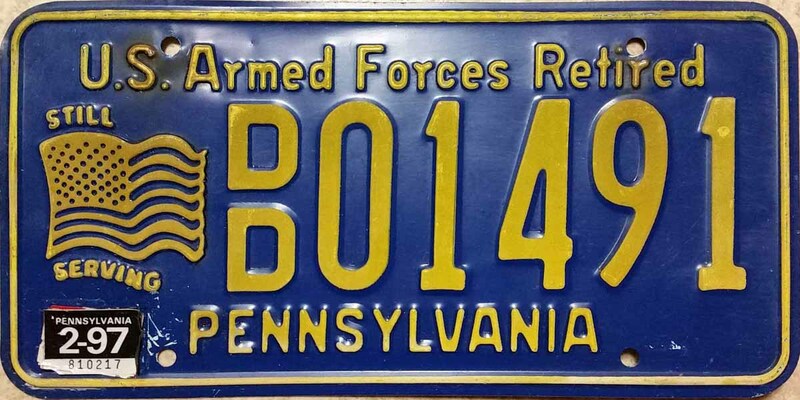 Replaced by www base on 5/17/2001. 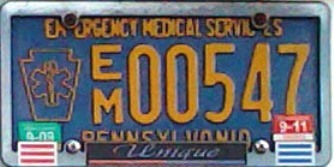 Replaced by www base on 10/5/2001. 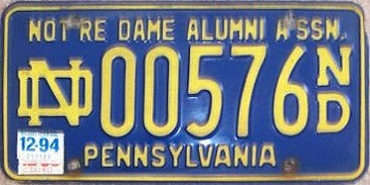 Replaced by www base on 6/13/2001. 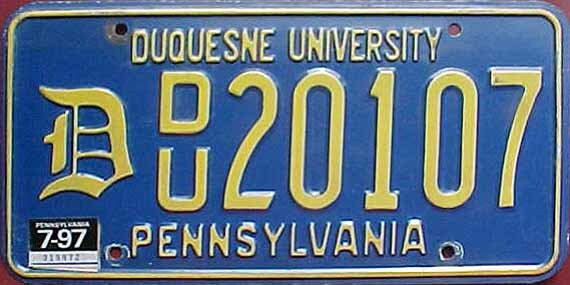 Replaced by www base on 12/26/2001. 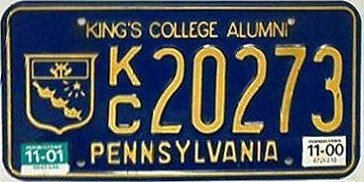 Replaced by www base on 7/25/2001. 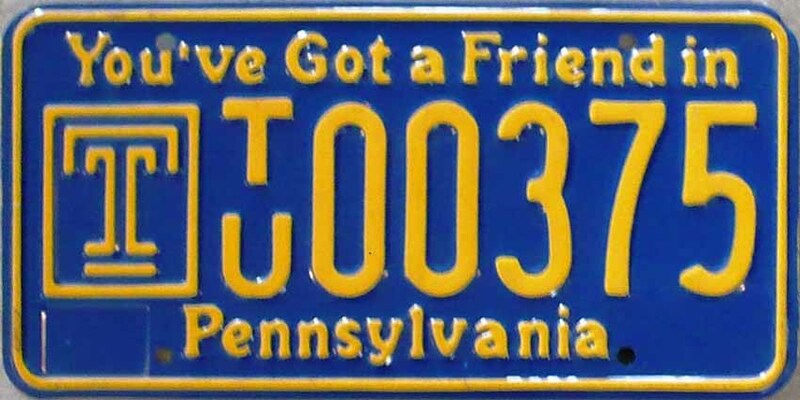 Replaced by www base on 6/20/2001. 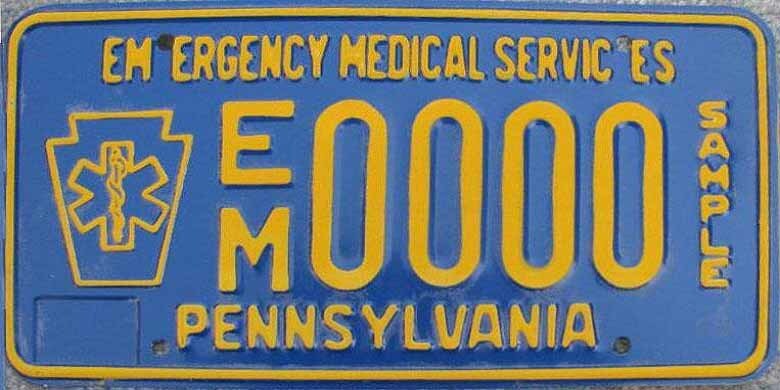 Blue on yellow base, no sticker wells. 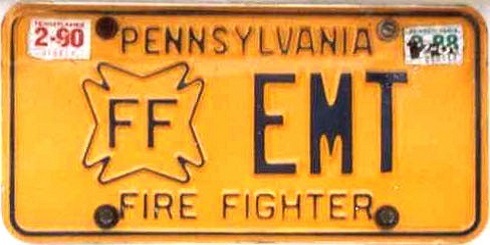 Replaced by www base on 9/1/1999. 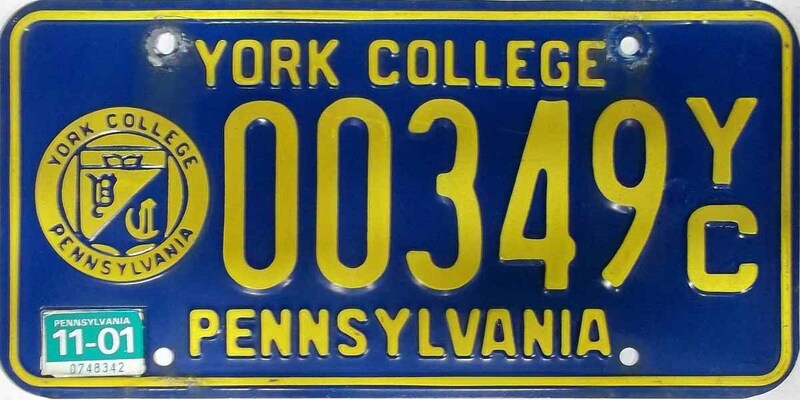 FORMAT 2, Personalized FF+ 1 to 5 characters, blue on yellow base, no sticker wells. 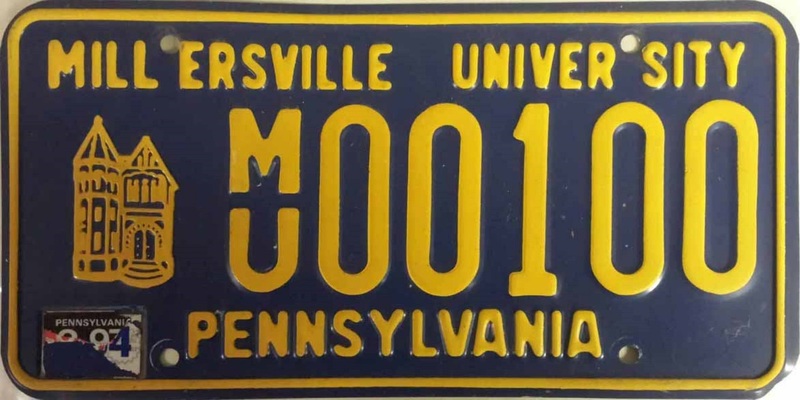 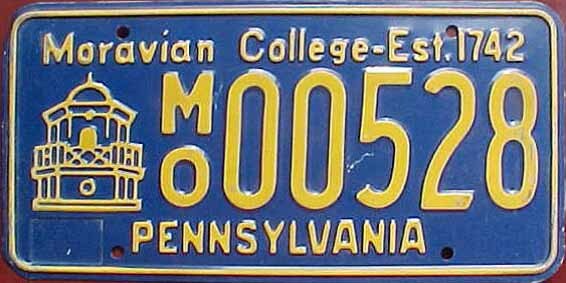 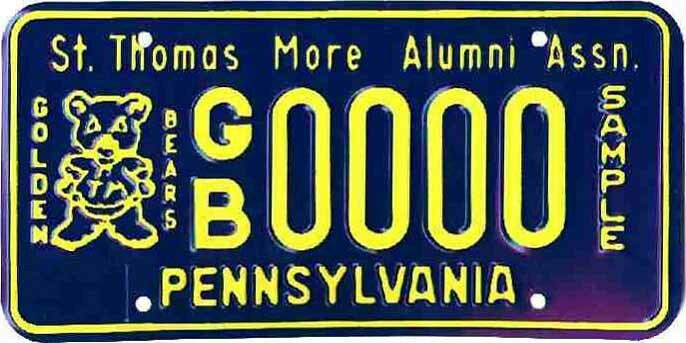 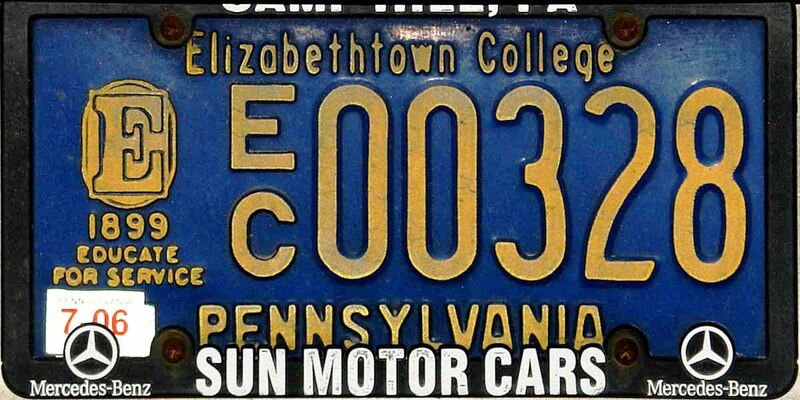 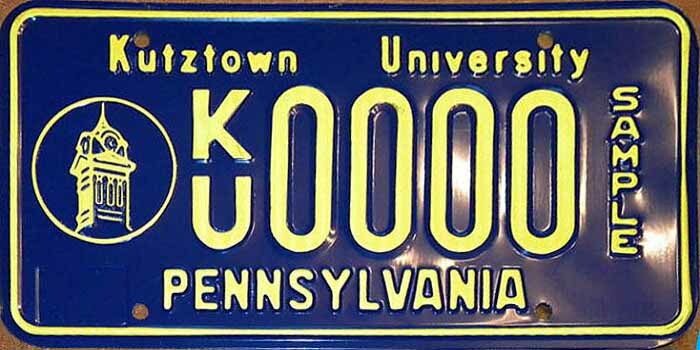 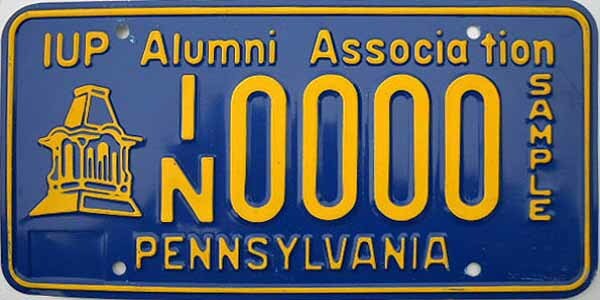 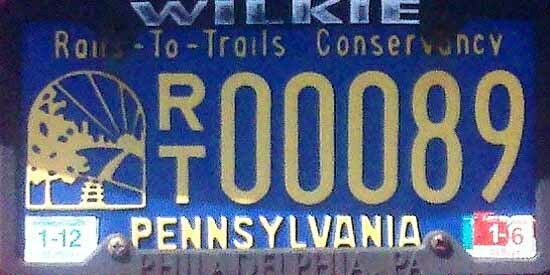 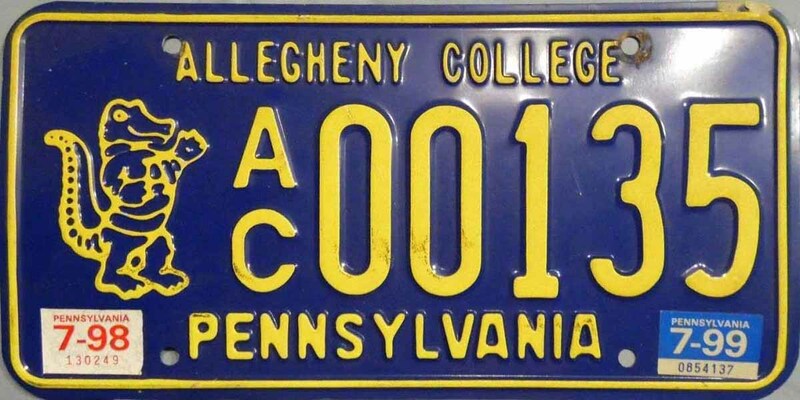 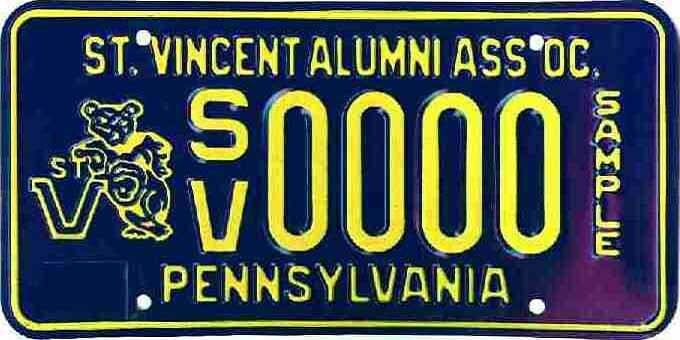 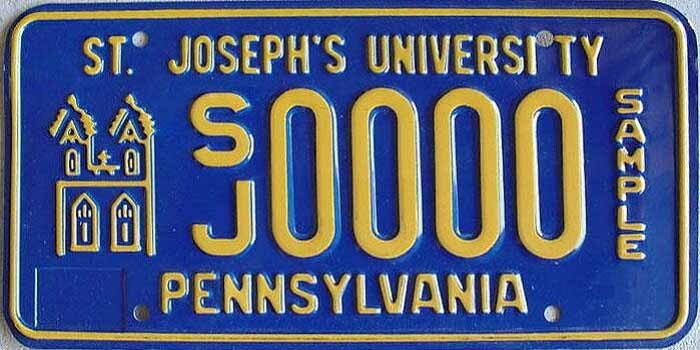 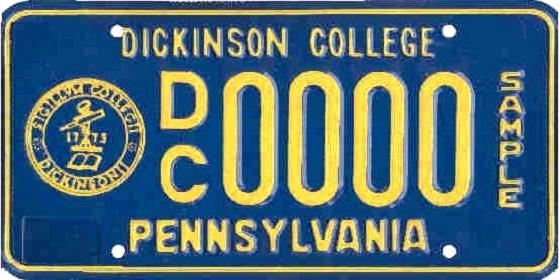 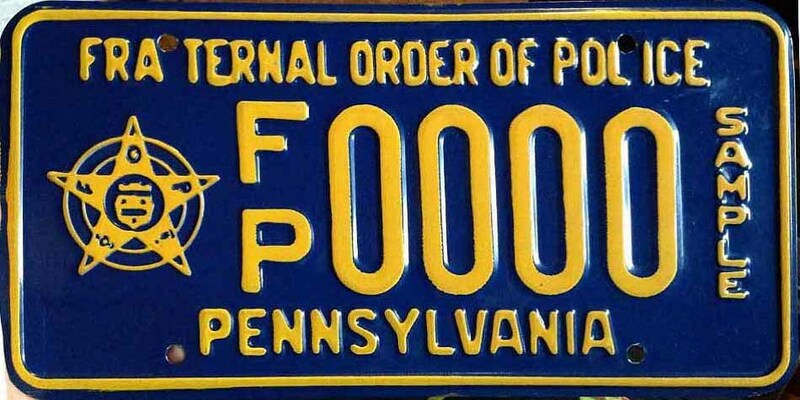 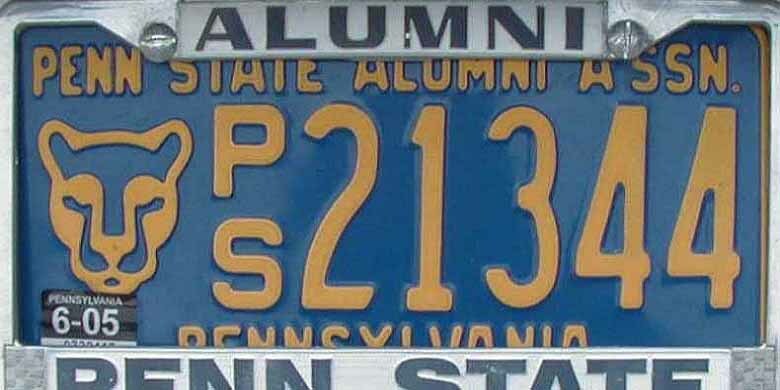 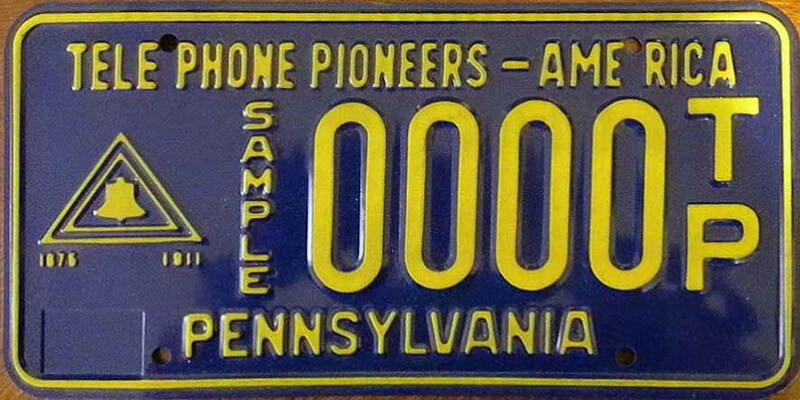 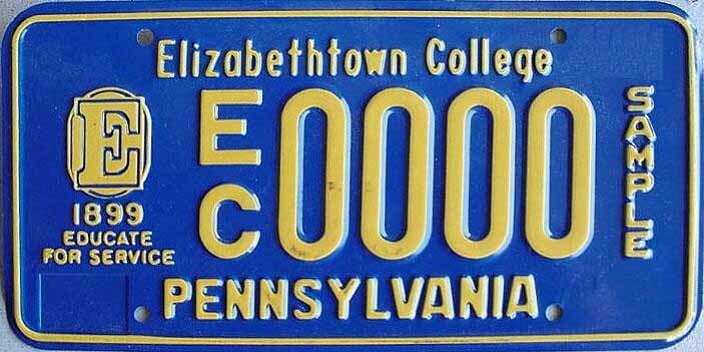 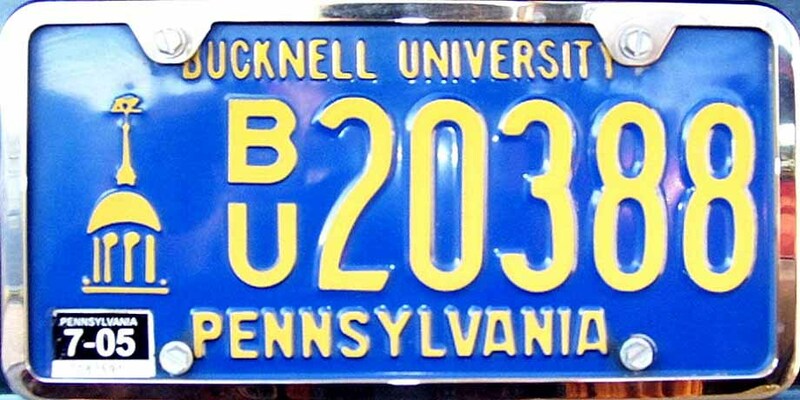 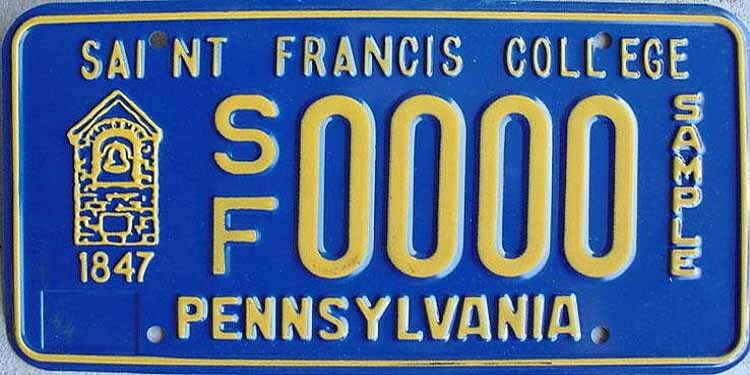 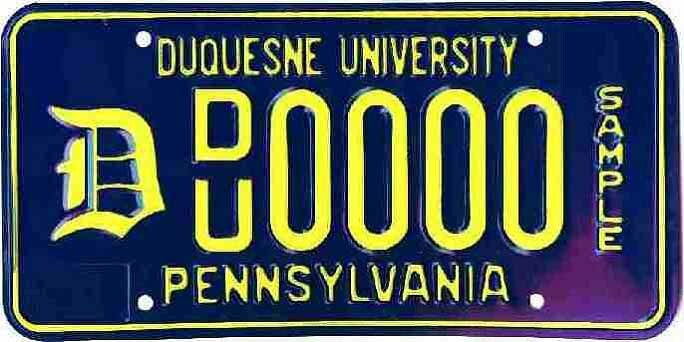 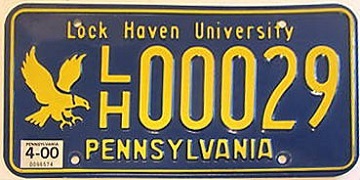 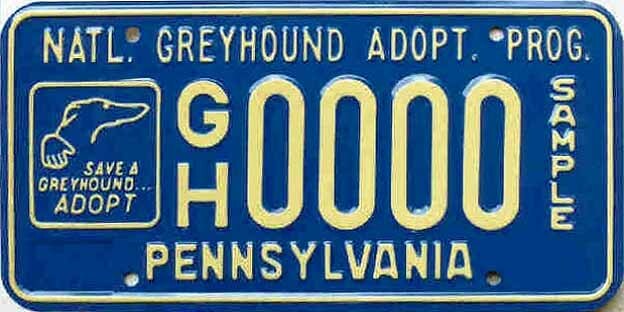 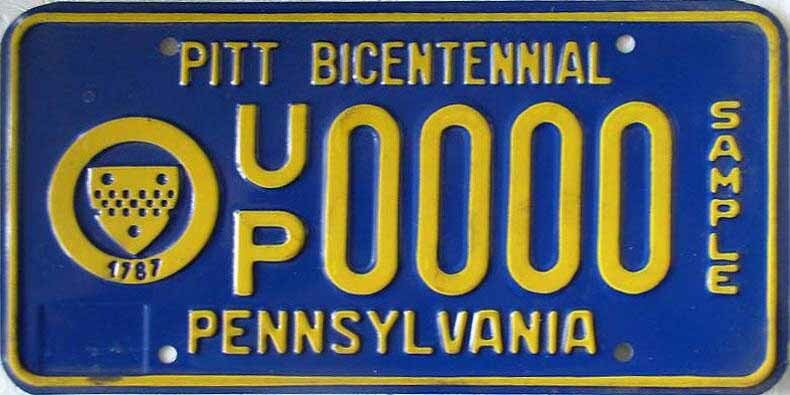 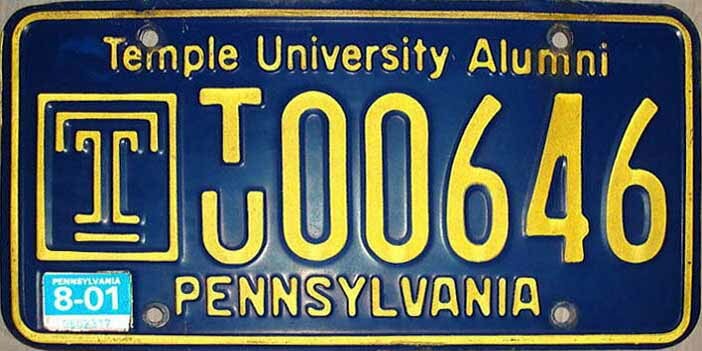 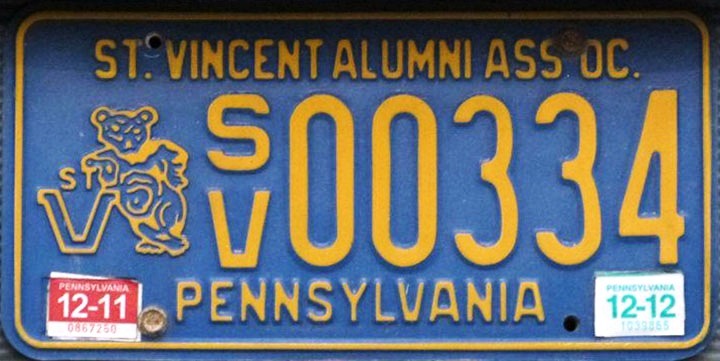 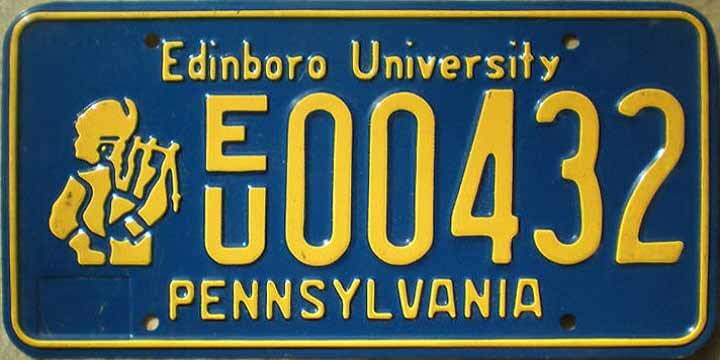 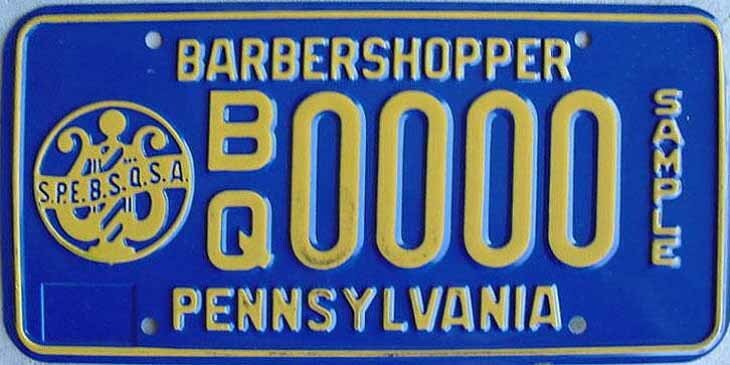 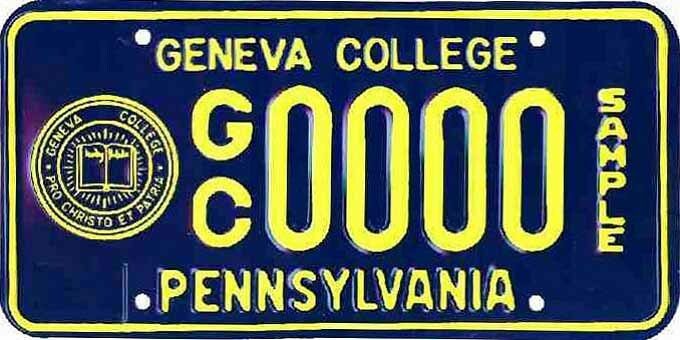 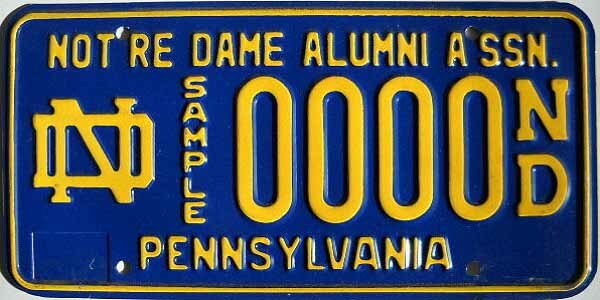 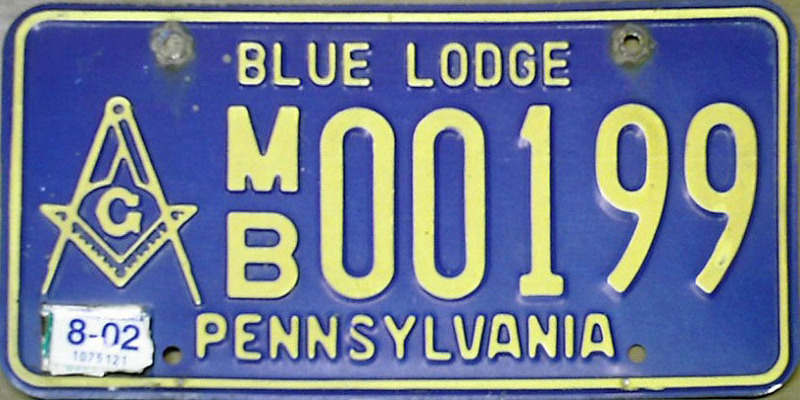 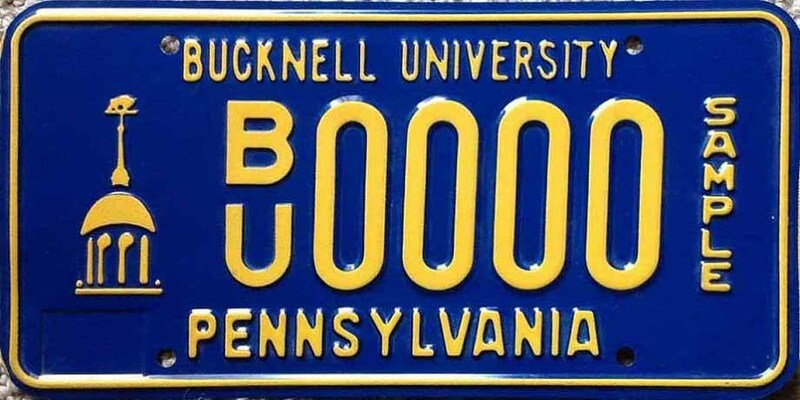 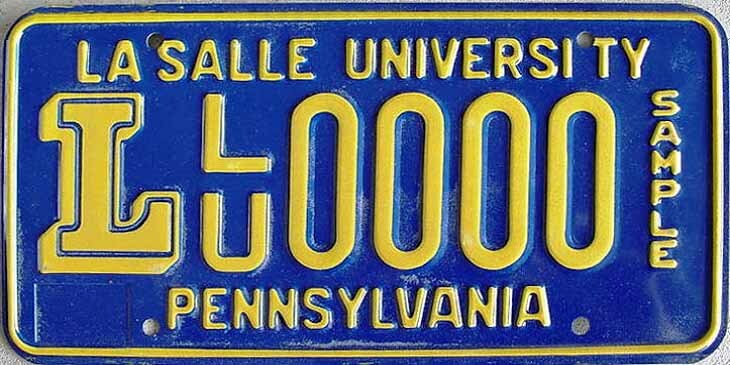 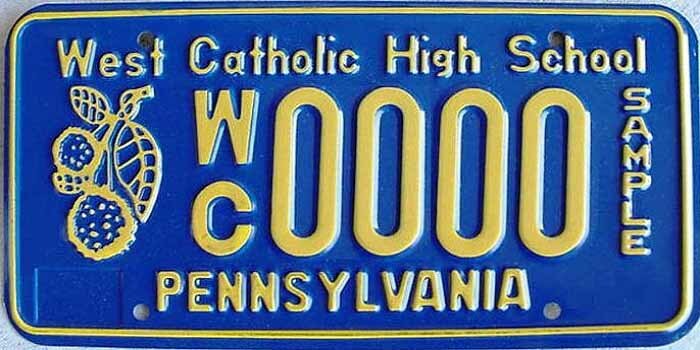 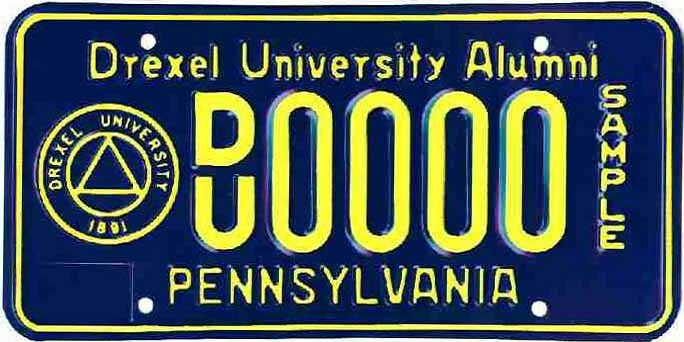 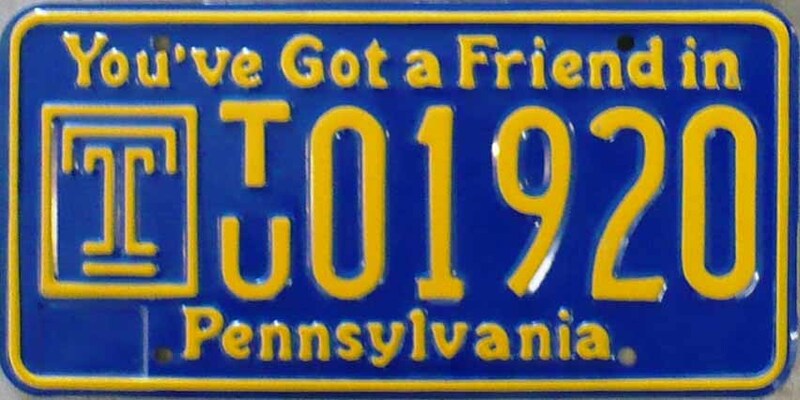 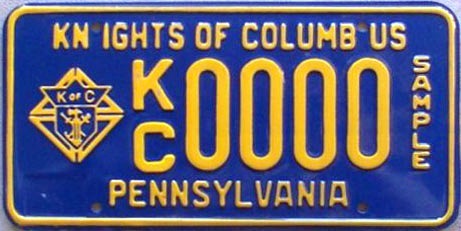 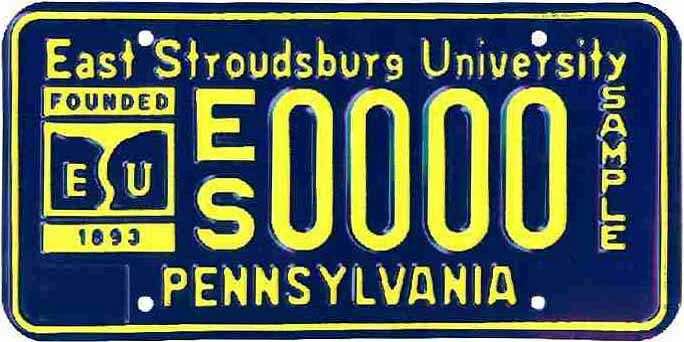 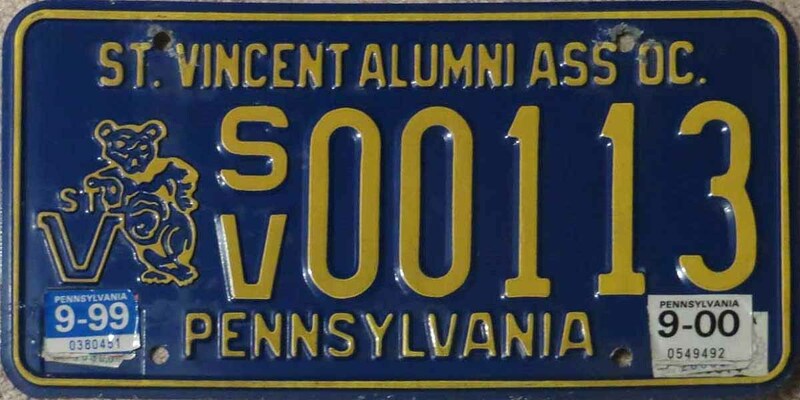 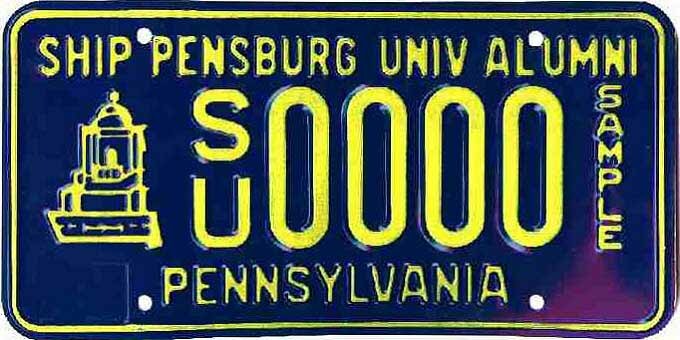 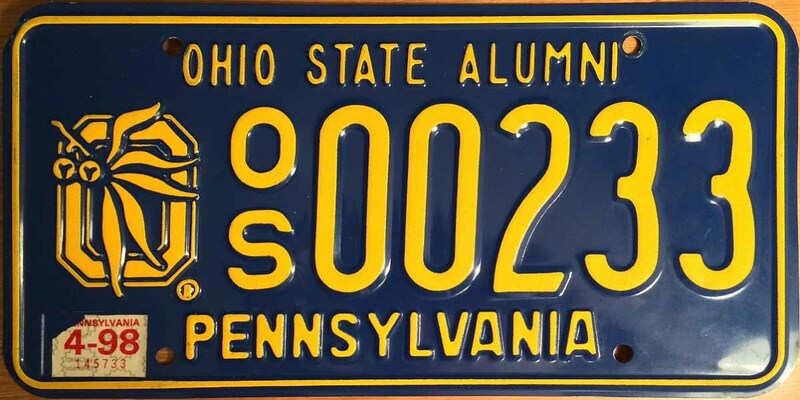 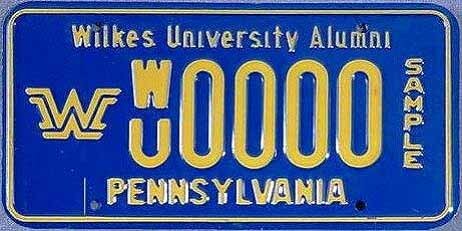 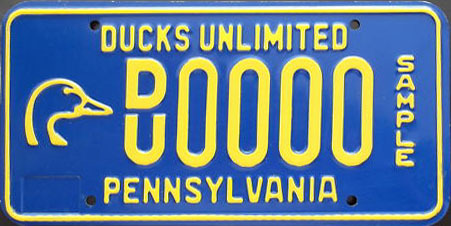 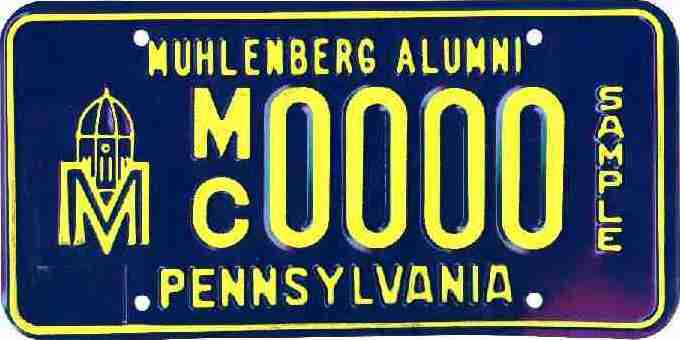 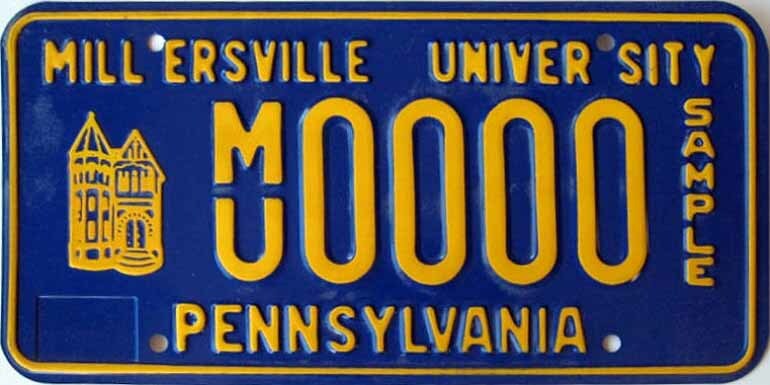 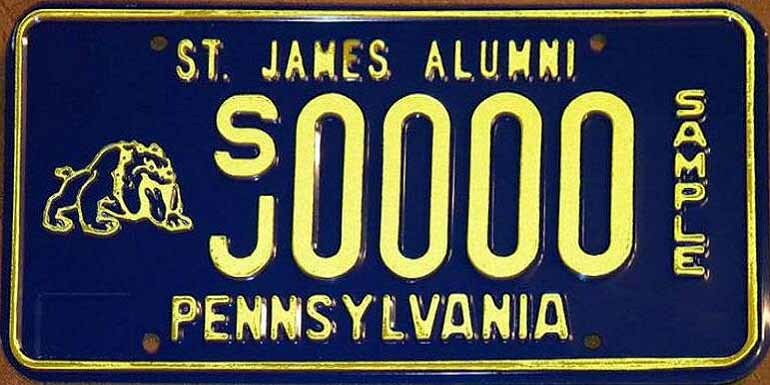 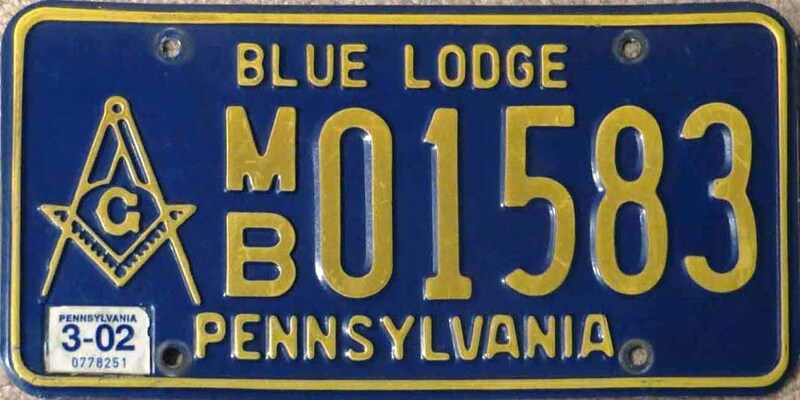 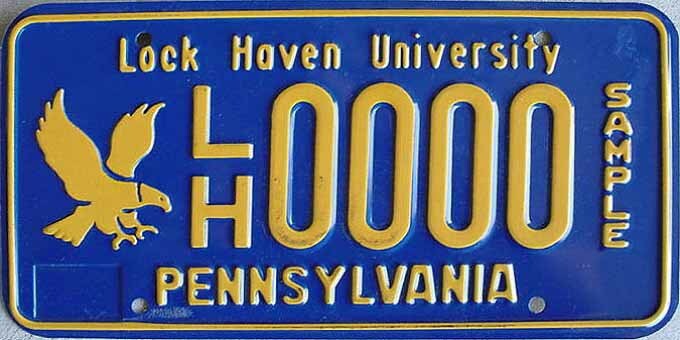 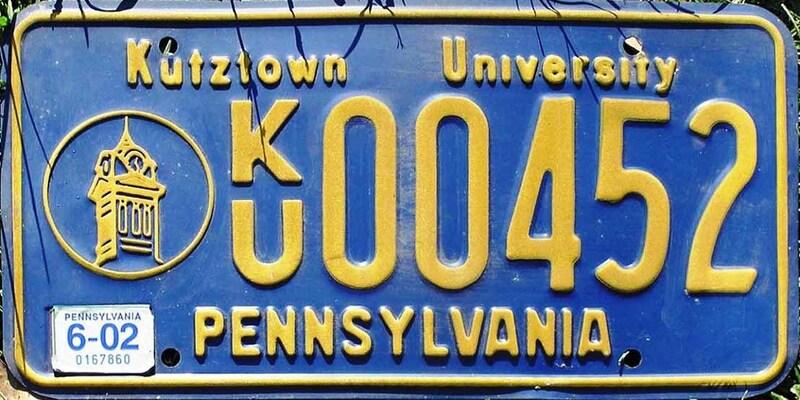 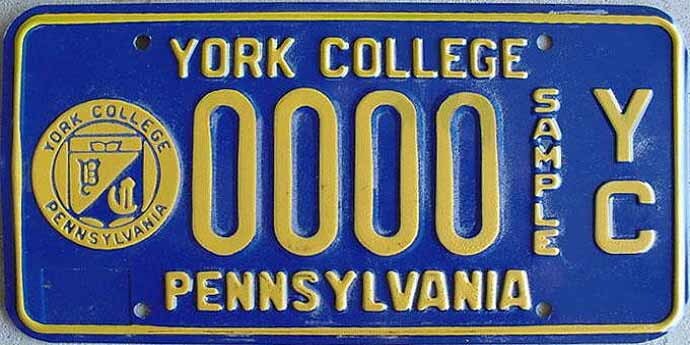 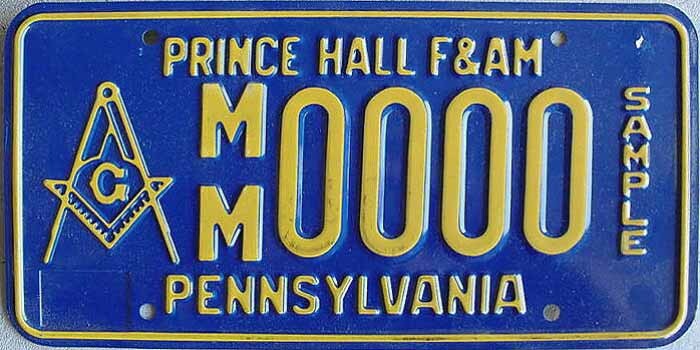 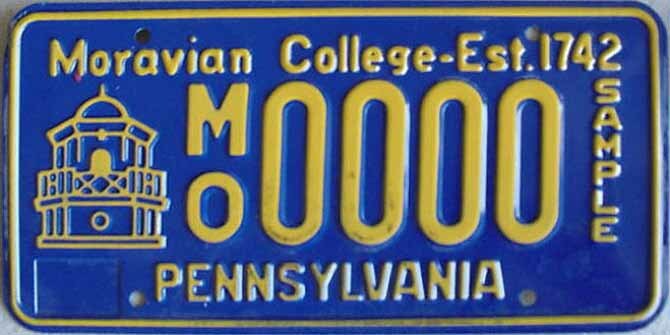 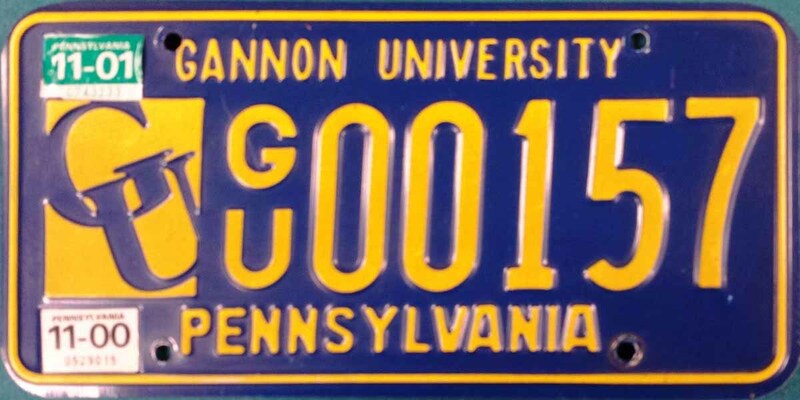 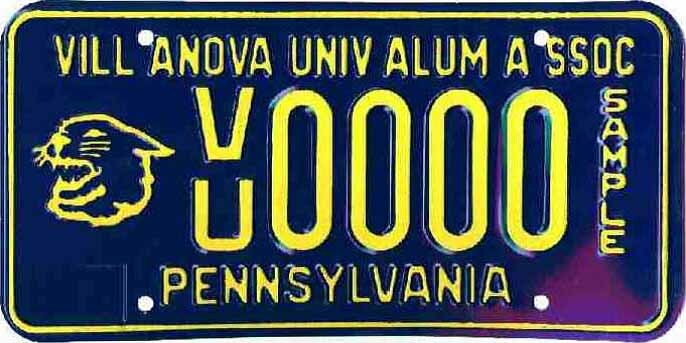 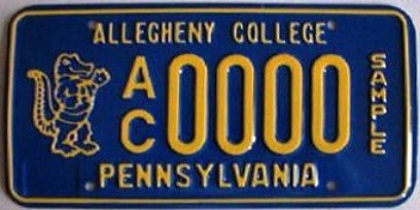 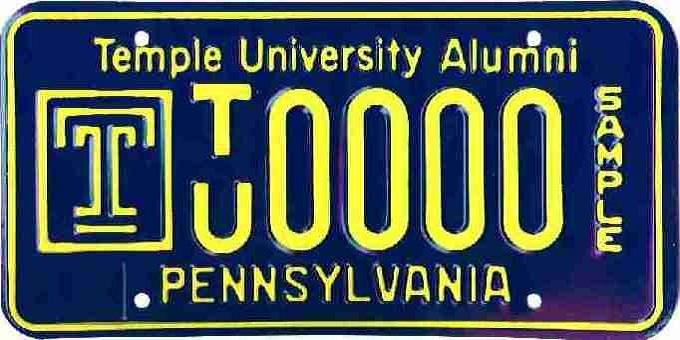 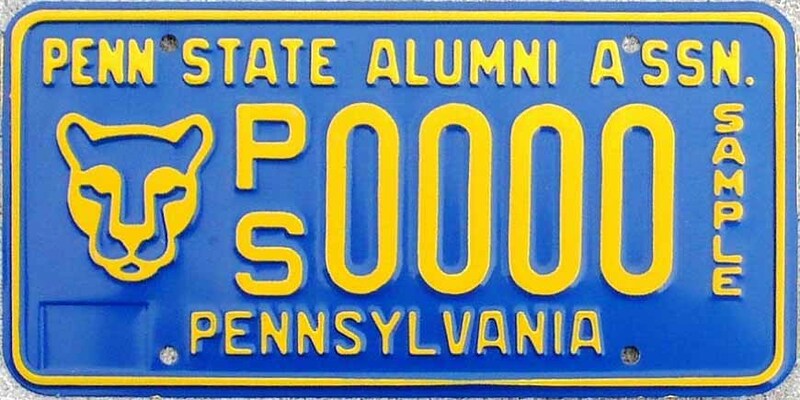 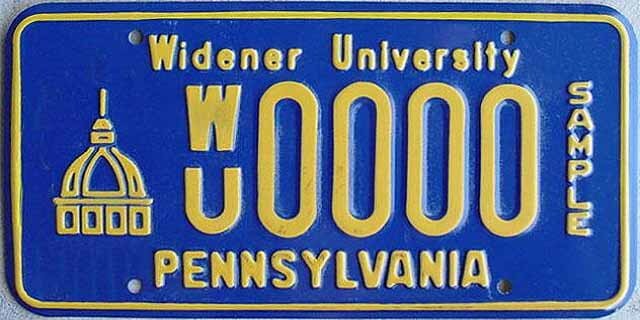 Personalized plates were offered early on for a short period, then discontinued. 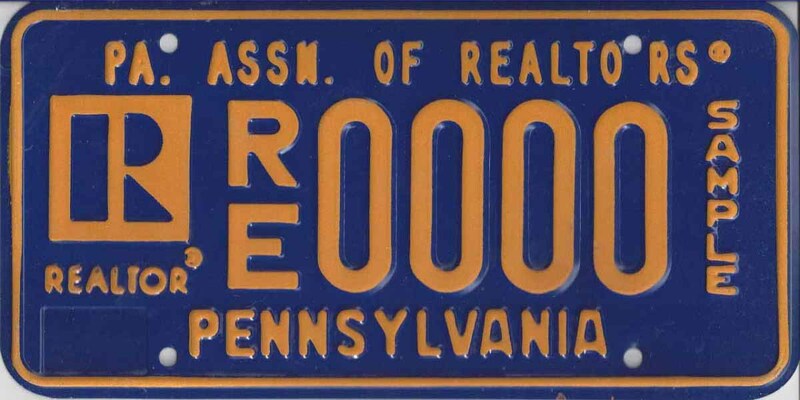 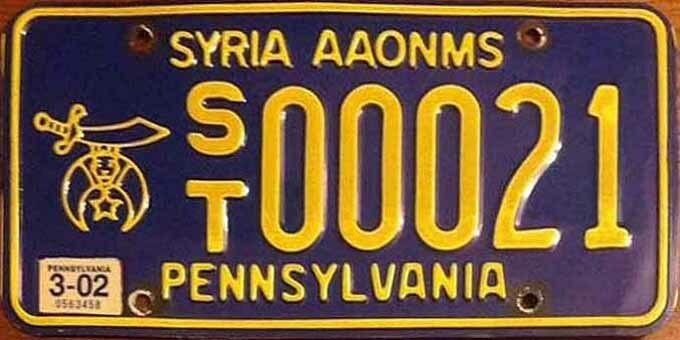 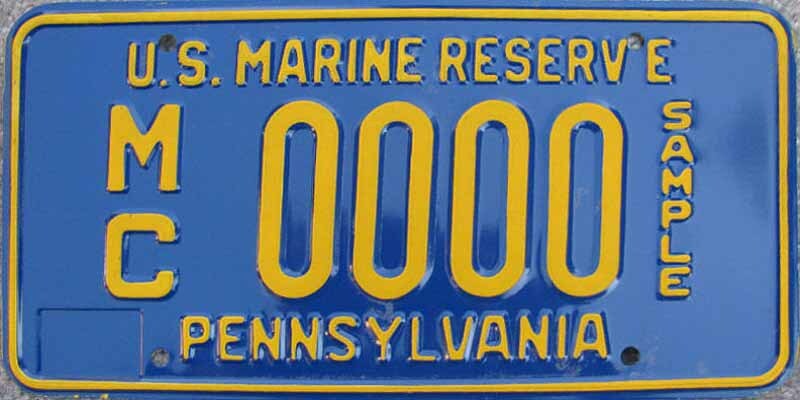 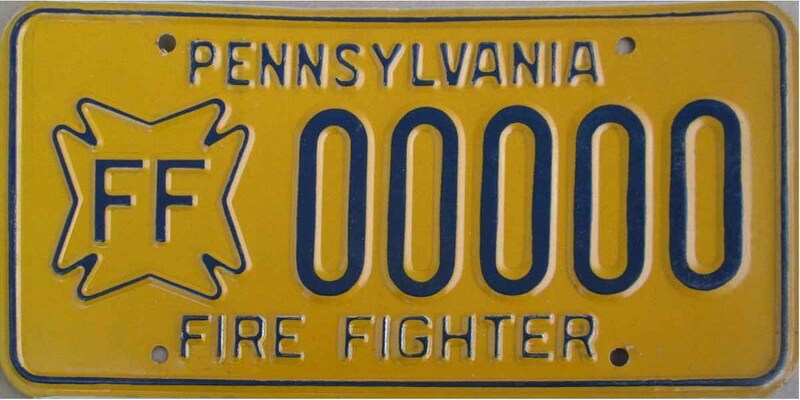 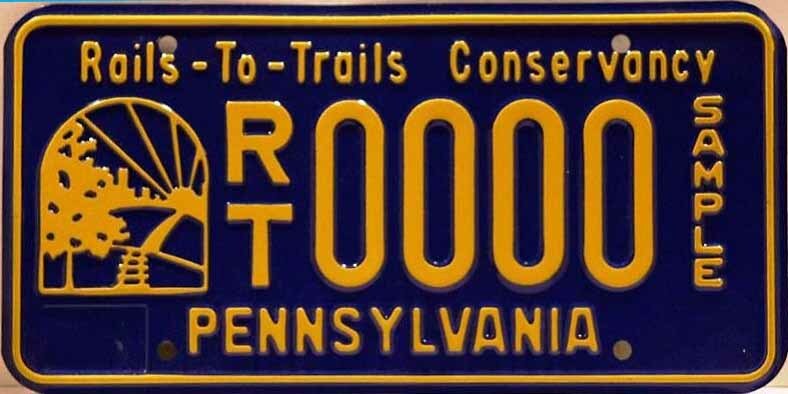 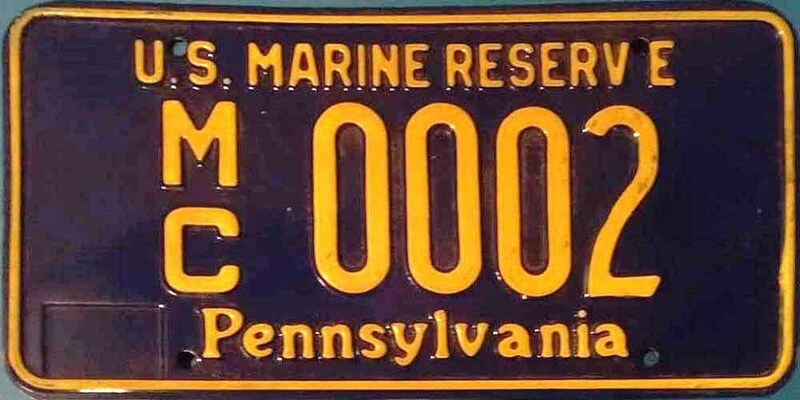 Vehicles that were issued such plates were permitted keep them and those plates that were eligible for reissue received new tags on the www base. 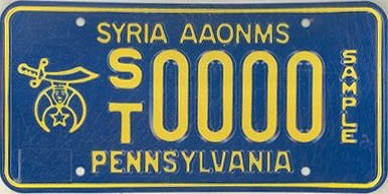 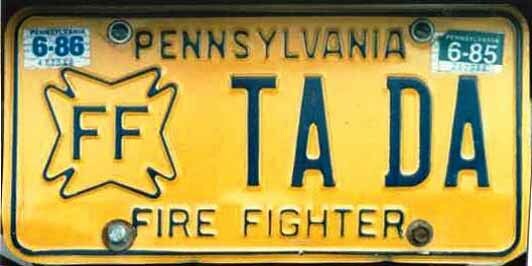 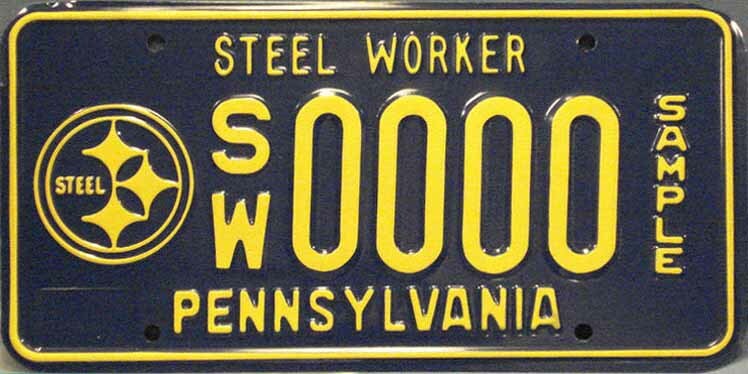 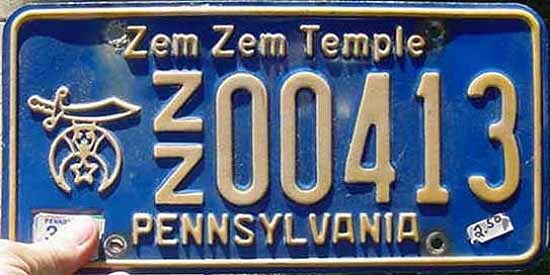 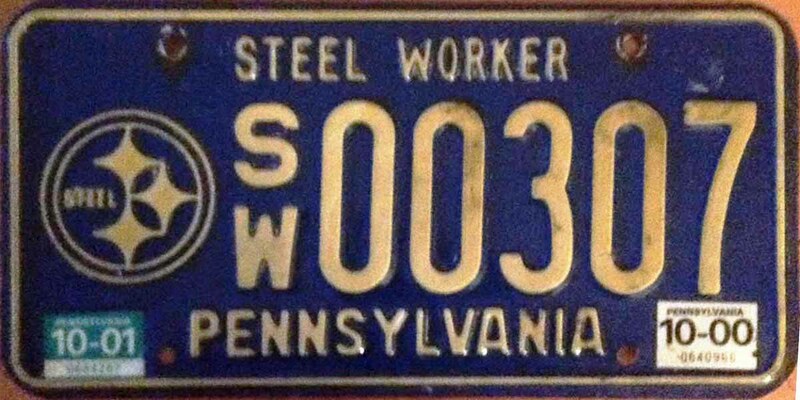 Sample S, The KEYSTONE STATE tag legend, sticker well lower left Sample does not reflect any issued plate. 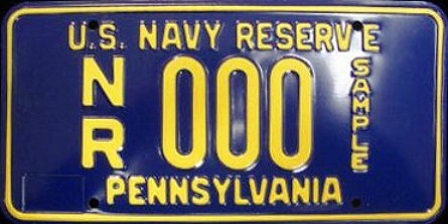 Replaced by www base on 10/3/2001. 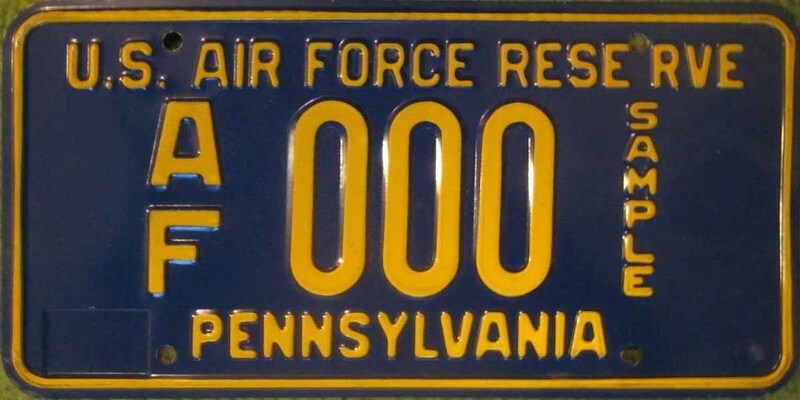 Replaced by www base on 11/9/2001. 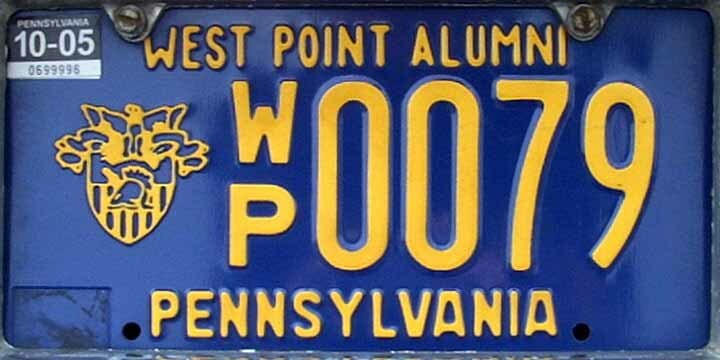 Replaced by www base on 6/27/2001. 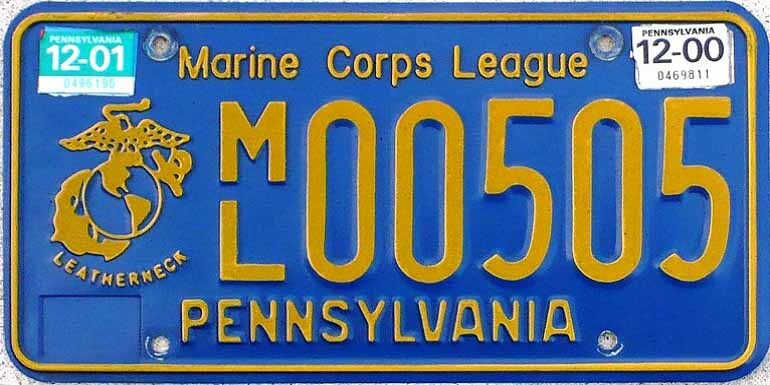 Replaced by www base on 9/5/2001. 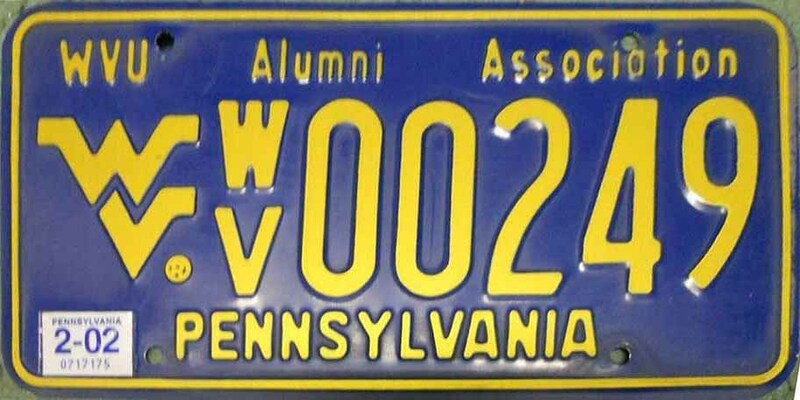 Replaced by www base on 10/17/2001. 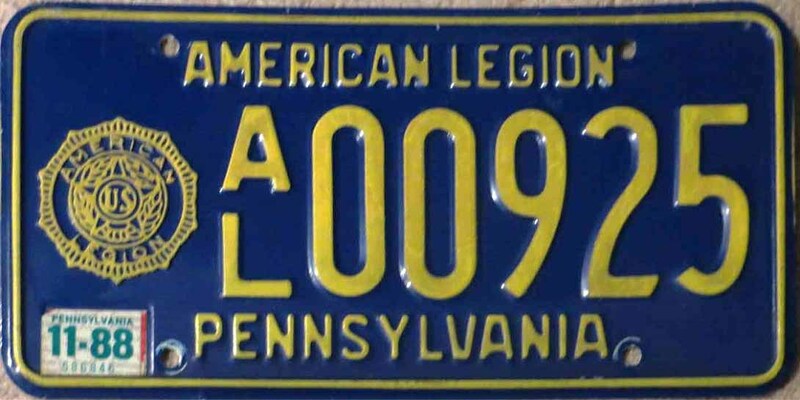 Replaced by www base on 6/6/2001. 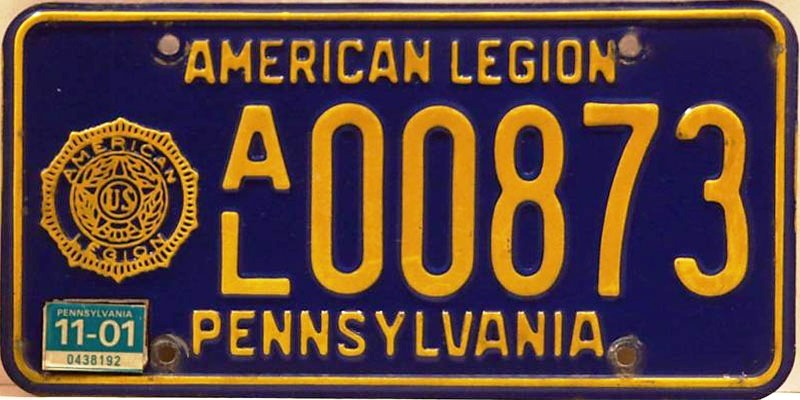 Replaced by www base on 7/18/2001. 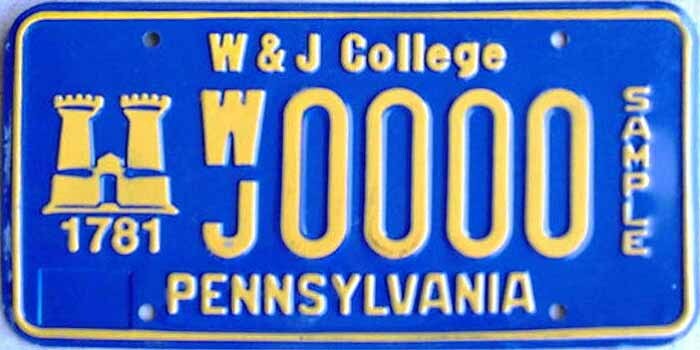 Replaced by www base on 3/26/2000. 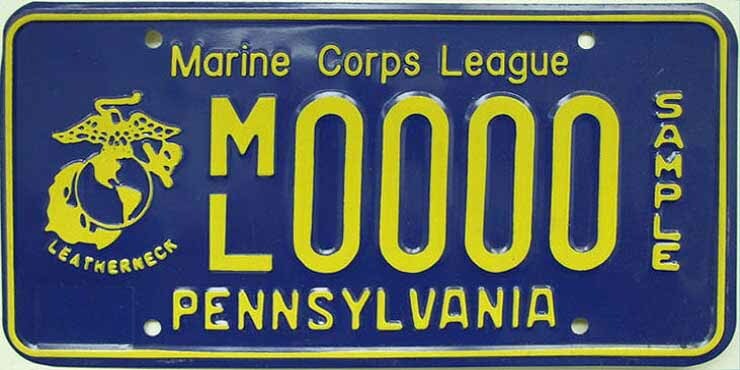 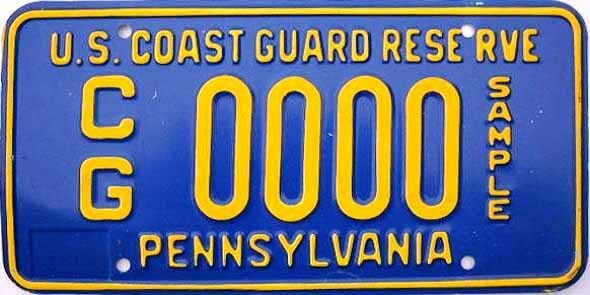 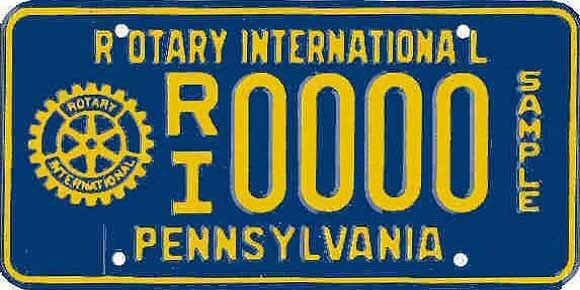 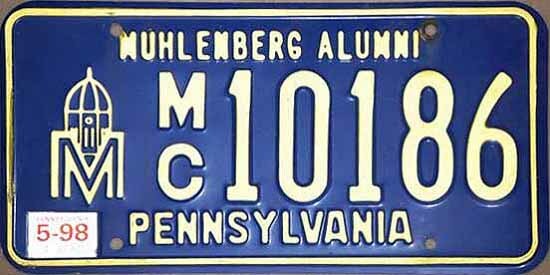 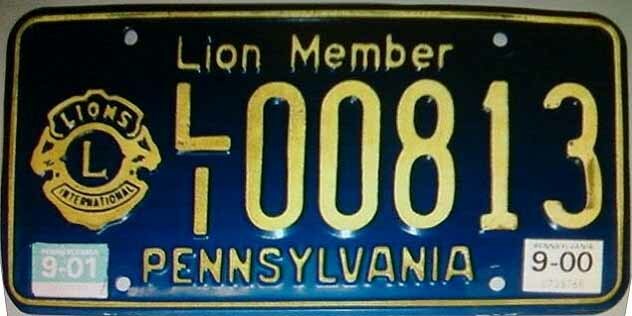 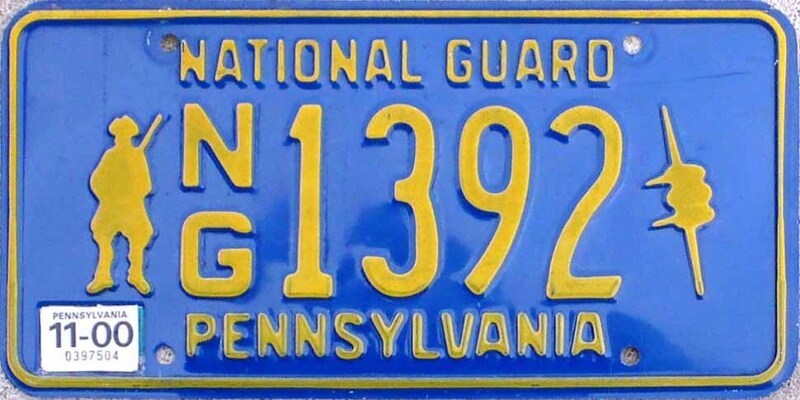 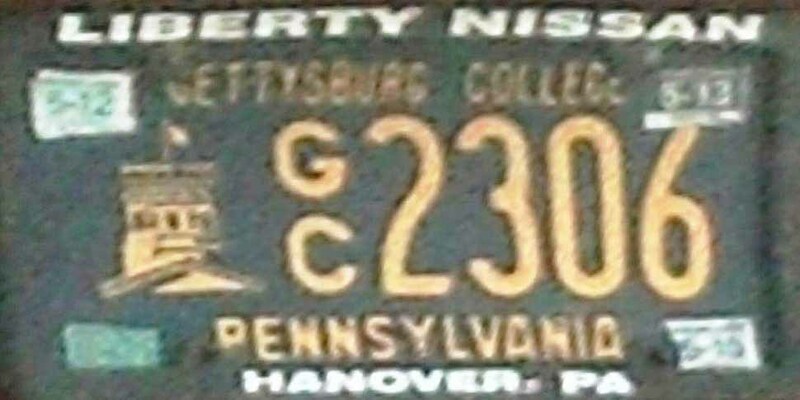 To see National Guard plates from 1930 to 1935 and from 1984 to the present click the link above. 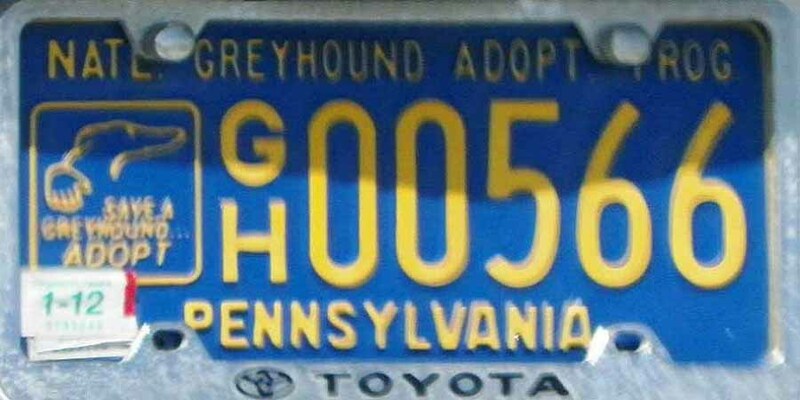 Replaced by www base on 5/30/2001. 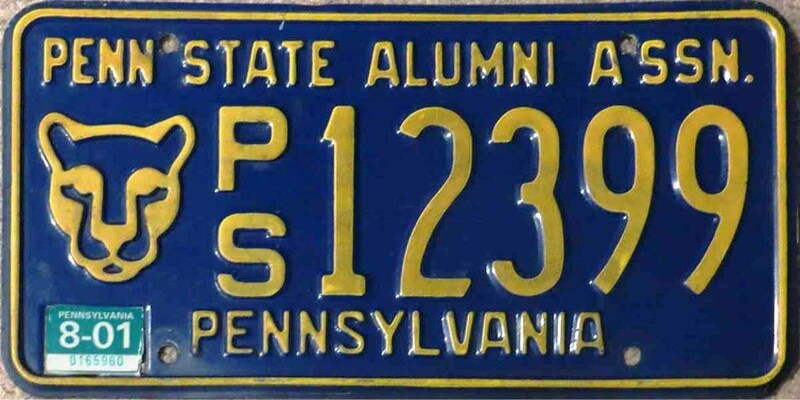 Replaced by www base on 2/14/2002. 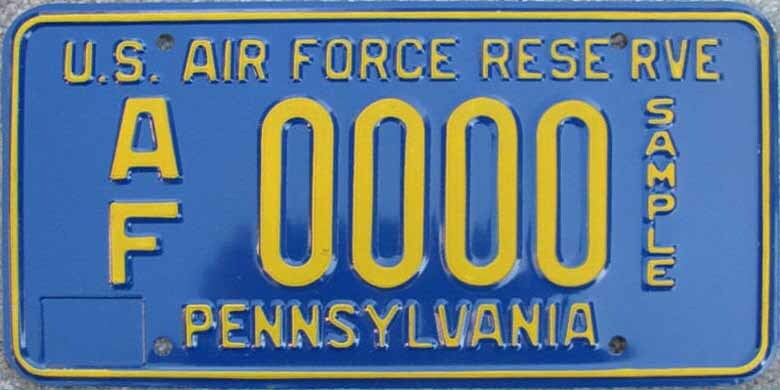 Replaced by www base on 11/20/2001. 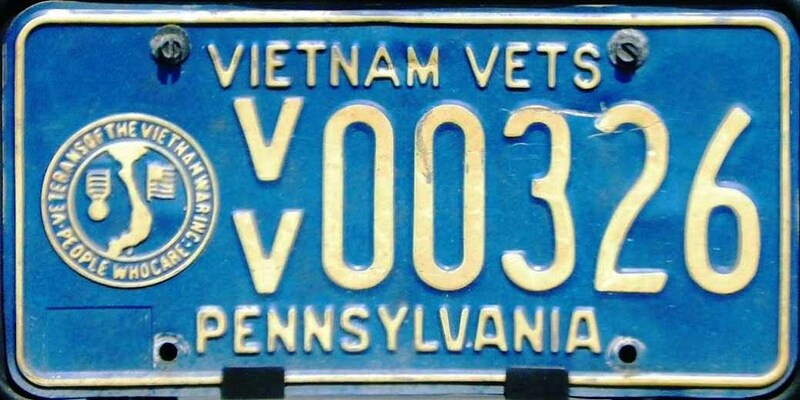 Replaced by www base on 3/7/2002. 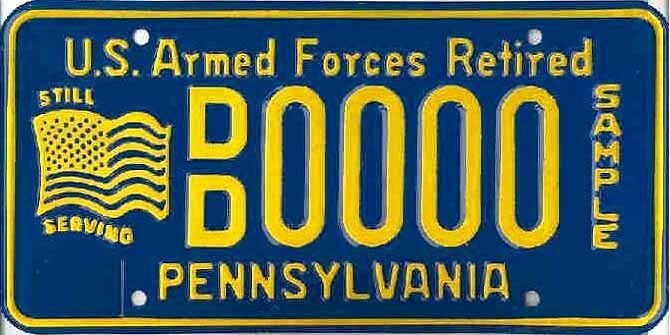 Replaced by www base on 11/28/2001. 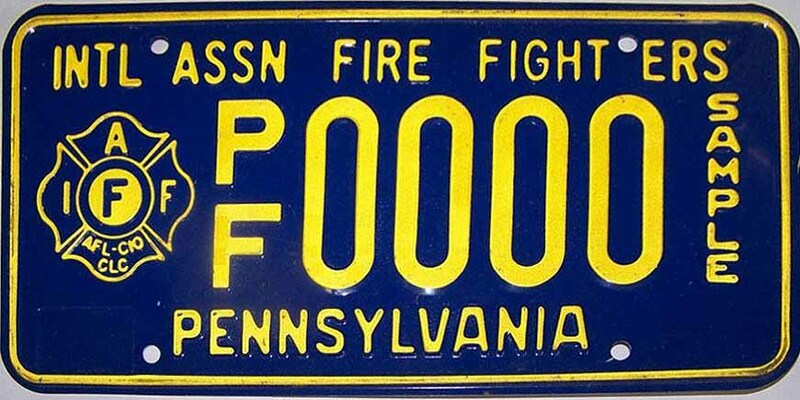 This is not a special organization plate but a special class of plate. 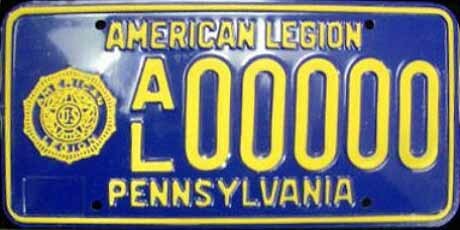 Very interesting back story from Sarge. 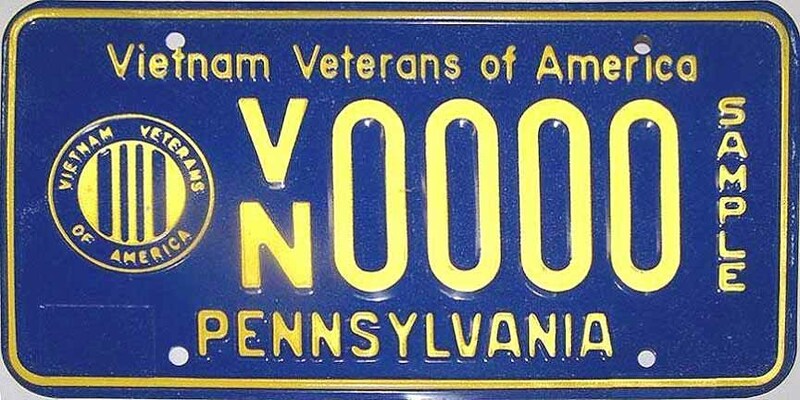 "Back in the 80's I was in the Marine Corps Reserve stationed up at NAS Willow Grove. 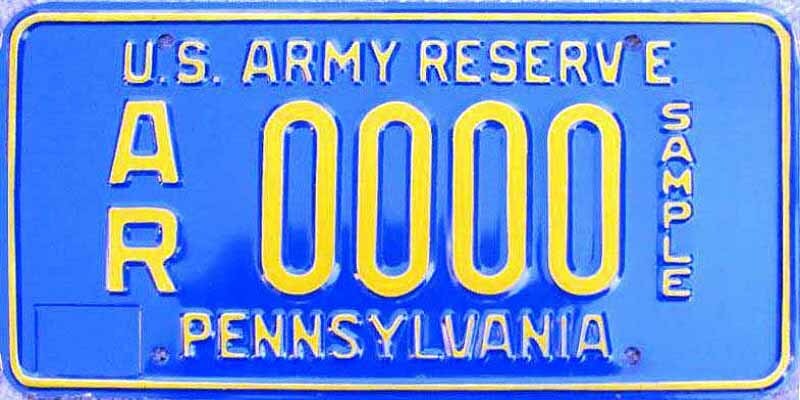 I assisted our admin officer with preparing the paperwork necessary to request the DMV issue specialty plates for the reserves. 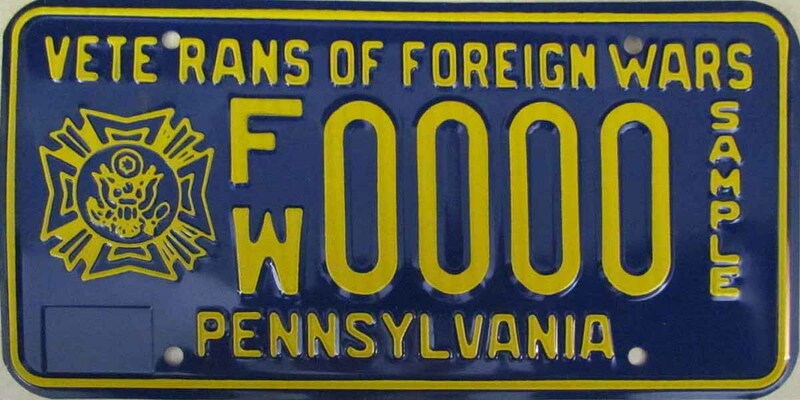 We of course were the first to be notified of the DMV's approval and of course the first to apply for the plates. 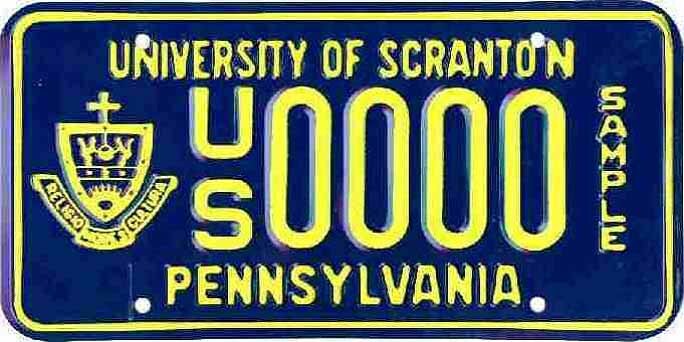 He received number one and I, number two. 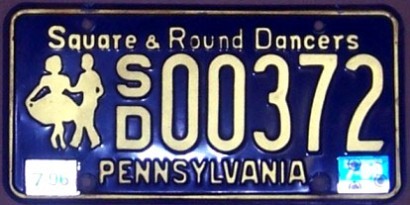 Years later I lost the plate when my truck was scrapped and I never expected to ever see it again but sure enough I ended up finding it at the Chesapeake show."